Family Volley: Because I am Hungry. It is late and I have been at church meetings all night. I MISSED dinner and now I am HUNGRY. Really hungry. I don't care that it is 10:56 at night. I am going to make this family favorite. My mom started making it when I was a kid. Its not a secret. It is all over the web. I am going to make it right now. And then sit down and eat it. I won't regret it in the morning because it is that good. Anyone else hungry? Give me 25 minutes and come on over. I will save you a fork. I will be eating right out of the bowl. Hope you don't mind. In case you can't make it to my house tonight, tomorrow will work, there will be leftovers. Or, here's the recipe. Goes with the theme for the week. I am "sharing". When you make it, eat it, enjoy it, think of me. And how grateful I am for you. And how wonderful I think you all are. This blogosphere is filled with strong women who are making families stronger. Thank you for that. p.s. I usually do the overnight in the fridge, but no time, too hungry. 6 large chicken breasts, boiled till cooked, cut into bite size pieces. Combine all the ingredients except the spinach. Place overnight in the refrigerator in a tupperware or ziplock bag. 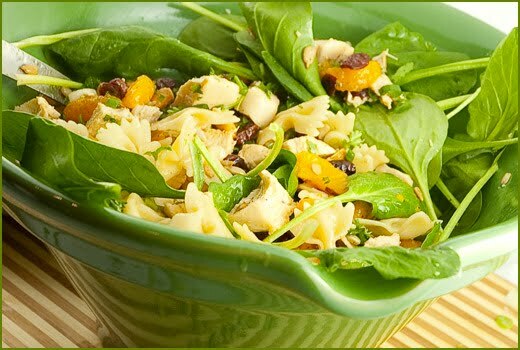 Before serving: Mix together refrigerated ingredients and spinach…serve. My little boy is being blessed on the fourth. I will sooo be making this for the festivities! Thanks! A baby blessing on the 4th. That will be wonderful. This salad is a meal in itself. Add some really good rolls and a dessert and you are good to go. Congratulations. How are you feeling? my nephew is getting blessed on the fourth...I was just thinking the same thing. this could be YUMMY!! Tiffany, Your family will love you for bringing it. I hope you and Amanda have a great "blessing day." Heather, you are so sweet. I am doing well, aside from all the anxiety I feel about all the in-laws coming in to town this weekend. There will be a lot of people trying to fit in to my little house, and I have some sisters-in-law who always like to find things to complain about. My goal is to just have a fantastic weekend regardless of crowds and bad attitudes. The 4th is one of my favorite holidays, and my son's blessing is very important to my little family. Oh Amanda, I totally understand the in-law anxiety. Mine are coming for our son's baptism the last week of July and I am already doing my breathing exercises. Hahaha. I hope the salad makes things easier and yummier for the blessing day. Put your sister-in-laws to work on the food, maybe it will give them less to complain about. Take pictures. We would love to see your big day. And I will set the same goal as you. Fantastic weekend regardless of crowds and bad attitudes. Well said. OK- so I am putting this together right now. Do I put the dressing on it to sit over night with the other stuff, or do I just keep that to pour over the top when I serve it? Amanda, you put everything together with the dressing. Put it all in the ziplock to sit over night. Then when you are ready, add the spinach to the ziplock contents. The dressing marinates together with all the ingredients to make things extra yummy.